The ENFORCER Room Monitor can be used to monitor the occupancy status of rooms in high traffic areas: restrooms, fitting rooms, etc. The Room Monitor uses PIR and phototransistor sensors to monitor the occupancy of a room. 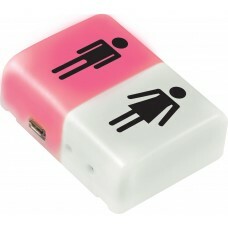 The 2-Room Indicator is ideal for monitoring multiple rooms at once. Current Draw- Active 35mA@12VDC max.